Fire Rescue crews arrived on scene at 7:36 a.m. If you are a resident and you wish to have your water tested ($7 fee), you may do so through the Pasco County Environmental Lab. Get more info here . A large sinkhole formed and swallowed two homes in a neighborhood in Land O' Lakes on Friday and officials say it could take months to clean up all of the damage . The Pasco County Sheriff's Office says the sinkhole, first reported as a depression, started out as the size of a small pool and a boat on the property was falling into the hole at approximately 7:36 a.m. on Friday morning. Officials confirmed the sinkhole is approximately 225-250 feet wide and approximately 50 feet deep. There is a 200-300 foot perimeter around the hole. The perimeter may be expanded if the sinkhole continues to progress. They're also treating the sinkhole as a hazmat incident due to septic tank damage. On Friday, officials were concerned that the sinkhole could merge into a nearby lake. Officials are monitoring the progression of the sinkhole and keeping residents out of the area. As of Sunday night, the sinkhole had not grown. At 8:23 a.m. on Friday, the sinkhole expanded and reached the roadway and at least 11 surrounding homes were evacuated. Neighbor Zamira Rodrigues was inside her home with her family when they heard it all. She said he heard cracking like a building was coming down. "What can you say? I mean you wouldn't wish this on anyone, especially our neighbors." Firefighters rescued two dogs from one of the homes before it collapsed. Pasco County Sheriff Chris Nocco went to the neighborhood. "Our hearts and thoughts go out to everyone in this community. This is Mother Nature and we don't know where it's going to go," Nocco said. Pasco County Sheriff's Deputy Jason Murphy was first to respond Friday morning, rushing into the second home as it sunk into a gaping hole. "At that point, large chunks in the ground were actually caving in," said Deputy Murphy. Deputy Murphy helped an elderly woman with a walker and two others to get outside. Risking his own life he ran into the home a second time to grab the woman's medicine. "There was a tall palm tree about 20, 30 feet that sunk down half-way, it fell over," said Murphy. "It just disappeared and then as the rest of the house started crumbling, large chunks, 10-15 feet across, would hit the water within seconds just gone." As of Friday night, the sinkhole stands at 225 feet wide and 50 feet deep. Experts believe it's done expanding, but several factors, including rain, could force it grow again. With no one hurt, the neighborhood has started to attract onlookers. But Sheriff Nocco is warning those who don't belong to stay out. Trespassers will get two warnings before deputies make an arrest. "You're going to go to a Land O Lakes jail," said the sheriff. "These people in the community do not deserve to have people come from the outside and put more stress on them." Duke Energy cut power in the area as a safety precaution, leaving 100 homes without power. Roads in the area have been closed and the Pasco County Sheriff's Office has set up checkpoints, allowing only residents in with proof of address at Cloverleaf and Pine, Grove and Pine, Lake Padgett Drive and Ocean Pines Drive. The sinkhole is located at 21835 Ocean Pines Drive in Land O' Lakes. ABC Action News has confirmed the home was a remediated home. According to the listing on Zillow, the property was a "repaired sinkhole" home. A property appraiser says the home was stabilized in 2014. 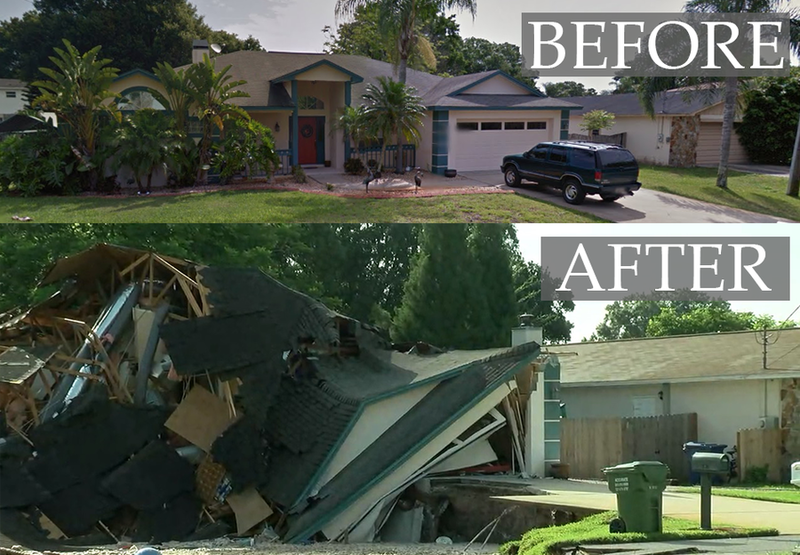 A previous sinkhole at the same Land O'Lakes home and an adjacent property was identified in 2012. Pasco County Property Appraiser Gary Joiner said stabilization, with a process called grouting, was completed in 2014. Joiner says dozens of pipes were driven up to 60 feet (18 meters) down into ground beneath the properties, then pumped full of concrete to stabilize the soil. Pasco Emergency Management, Pasco Fire Rescue, Duke Energy, Pasco Building Inspector and Pasco County PIO have responded to the scene. Pasco County and United Way Partners have teamed up to create a local fund to help the victims of the sinkhole.